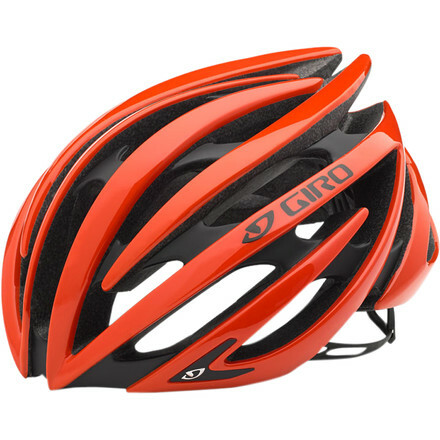 My current helmet of choice is a Giro Aeon in “glowing red.” The last time I was shopping for helmets, this was my helmet of choice and it was just a matter of selecting a color. I chose the flame red because it’s pretty visible, it matched my Giro Empires and it was on sale. It’s a fantastic helmet, light, pretty aero and good venting. At the time I was riding my Specialized in a matte charcoal finish, and with the helmet and shoes matching I could wear almost any kit and still be reasonably well matched and not look like I was color blind. With the arrival of my Cannondale in team colors (white/black/lime) I thought I would add a couple of touches to the helmet to give it some character and match the bike a little better. I didn’t want to get too gaudy or damage the helmet in anyway so I had to carefully think about how to do this. The obvious choice was to use some sort of vinyl tape. On hand at home I had some black decorative tape for auto and white electrical tape. With those two colors I just started trying different patterns and stripes on the helmet. Once I got something I liked, I carefully trimmed the excess off the ends (being careful not to cut into the foam either!) so it ended at the edge of the shell and didn’t overlap the foam for a professional look. I was pleased with my results but it needed something else. I had been looking for some lime green tape and had been unsuccessful so far, but one day on a whim I went into this auto parts store during some errands and there it was, the tape I had been looking for all along. I scarfed that baby up and went home to get working again! A little white, green and black added. Not a bad interpretation of the bikes graphics. Thanks and also for the pingback! You bet, man. Cool idea! Good job! I’d been thinking of doing this but didn’t trust myself, will now definitely have a go! Thank you! It was easy to do, best part about tape is if you don’t like it just peel it off and try something else. I looked at other helmet designs for some inspiration.